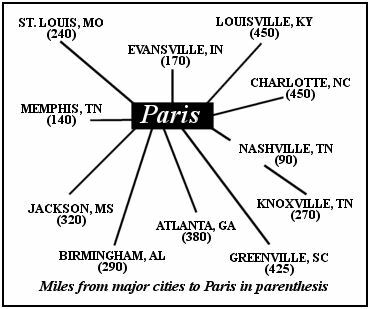 Paris, Tenn. is centrally located and is a day's drive from most of the Untied States. For those hunters who wish to fly commercial the best rates are into Nashville International Airport, which is 90 miles from Paris (TN). Those having private planes can fly into Paris-Henry County airport which offers a 5,000 foot runway and Instrument Landing System (ILS). Car rental service is available but please make request in advance of arrival to the airport office at (731)-644-7933.